The new Learning and Teaching Building (named ‘St. Alphege’ after an Anglo Saxon Bishop of Winchester) has formally opened for teaching. The building has been occupied since Monday 24th September, and has received welcome praise from lecturers, staff and students. The building forms part of Design Engine’s masterplan for the campus and successfully unites The University Centre and The John Stripe Theatre to form a new landscaped Piazza space fronting the Sparkford road entrance. The fast track construction programme (contractor Osborne) has meant that work continues on the adjoining, existing St.Edburga building which is undergoing extensive overcladding and refurbishment. 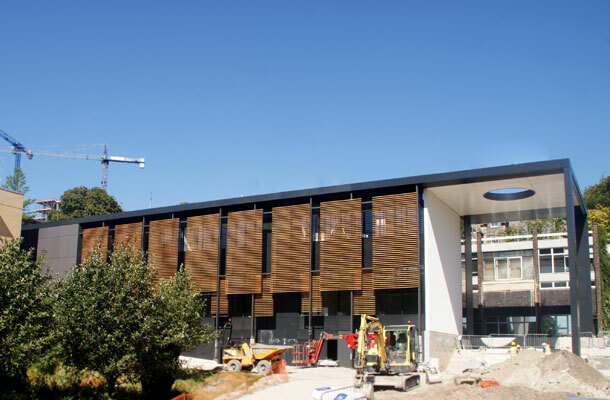 As well as overcladding, this building will also gain a new extension to the roof of the building, providing two additional teaching spaces and an entrance area to the steeply sloping King Alfred campus – linking upper and lower levels. The retention of the St.Edburga building will improve thermal and environmental performance of the building and substantially extend the life of a building that may otherwise have been demolished. The Artwork to the front of the St.Alphege building is in production and is due for installation shortly. Design Engine are working closely with specialist contractor Littlehampton Welding to finalise what will be a dramatic element to the newly formed Piazza space.